Summer reading slide setbacks not only affect student performance in the coming school session, but many teachers have to reteach skills, and over time, these setbacks can have a lasting impact on students’ academic future. Learning Ally human-read audiobooks is a proven solution. Summer reading slide effects the children who need to read the most. Our rewards-based program is “ready-to-implement” for teachers and has popular choices that students will love. Human narration transforms a story into an adventure! 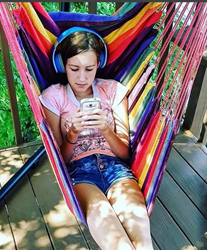 Learning Ally has kicked off its “Summer Reading Together,” a program designed to motivate struggling readers to read for twenty minutes a day using human-read audiobooks. Each year, thousands of students experience summer reading slide, especially those with print and learning disabilities. Reading skill setbacks not only affect student performance in the coming school session, but many teachers have to reteach skills, and over time, these setbacks can have a lasting impact on students’ academic future. Exposure to human-read audiobooks can significantly enhance a struggling reader’s ability to read more fluently and to make deeper contextual meaning to content. As students become engaged in the reading process, they are apt to read more and enjoy the experience, while building foundational skills in reading comprehension, vocabulary, and critical thinking. Learning Ally, a leading ed-tech nonprofit organization, delivers a comprehensive audiobook learning solution for struggling readers, and students with learning differences, like dyslexia. Students who qualify typically read below grade level, but have the aptitude to be high-level achievers. Teachers rely on Learning Ally to provide a quality reading accommodation and access to grade-level K-12 textbooks, novels, and literature. A four-part scaffolding ‘take-home’ lesson. Detailed parent letter describing the program. Instructions to use Learning Ally’s mobile app. Grade-appropriate summer reading list to engage all readers. Tracking card to record reading activity for self-motivation. Twenty top prizes award students for their efforts and a social media component enters them in a random drawing to win a Chromebook. This year, over 20,000 student members participated in Learning Ally’s reading engagement programs, including its signature national reading competition – The Great Reading Games. The nonprofit also recognizes exemplary administrators, teachers and students nominated by their peers with financial scholarships annually. Learning Ally’s Summer Reading Program begins June 1 and ends August 31, 2018. Contact Learning Ally at 800-221-1098 and schedule a demo at http://www.learningally.org/educators.